The movie begins with an intense prologuenot unlike that of Antichrist, a spectacular, slow-motion narrative covering the last moments of Justine and Claire before Earth collides with another planet, all cut to Wagner's "Prelude to Tristan und Isolde," which will recur throughout the film. Images both disturbing and sublime already begin to establish the different ways in which Justine and Claire will meet the impending apocalypse. I saw it at a packed house at the Lincoln Center's Alice Tully Hall, barely managing to squeak in as a standby, and I can tell you, this 10-minute sequence was met with thunderous applause. It is such a magnificently executed sequence that it could stand alone as a short film. A quick flash of the titles later, and Von Trier flashes back to Justine's wedding night in "Part One: Justine." Typical situations play out illustrating the awkwardness between bride and groom (Alexander Skarsgård), bride and her divorced parents (John Hurt, Charlotte Rampling), and bride and her father-in-law/boss (Stellan Skarsgård). But there are hints that Justine's stress goes beyond the usual wedding jitters, as Claire's concern over her sister seems just a bit too zealous, which is nothing compared to the obsessive control Claire's wealthy husband John (Kiefer Sutherland) is exerting to make sure Justine doesn't ruin her own wedding. That Justine is soon disappearing from the reception to pee outside on John's 18-hole golf course is but one of the signs that Claire and John are justified in worrying about Justine's mental state. I'll avoid describing "Part Two: Claire" in great detail, because this is the meat of the film. 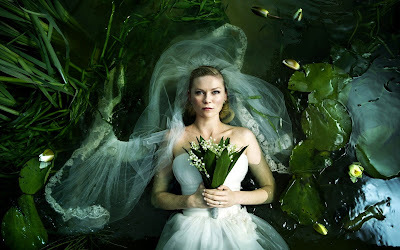 Harrowing and suspenseful, this section features career-best performances from Dunst, Gainsbourg, and Sutherland, each of whom react to the appearance of a new planet in the sky, Melancholia, in their own unique ways. For John, the approach of this planet brings a dawning realization that his wealth cannot exert control over the situation. For Justine, her resignation belies the fact that she is ultimately best equipped to respond to the finality of the circumstance. And for Claire, who's always relied a bit on her husband in making her decisions, a terrifying epiphany awaits. 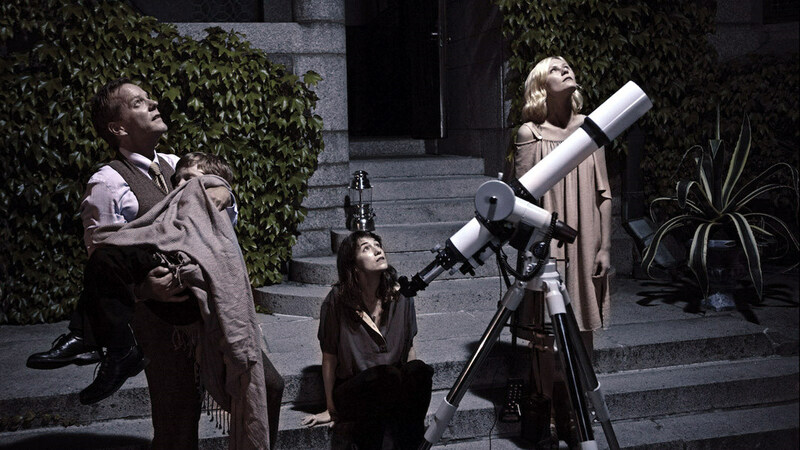 Melancholia is so exquisite an objet d'art that I hesitate to ascribe a political meaning to it, although for anyone interested in those dimensions, they are present and plain. Instead I choose to ponder some of the spiritual implications of the film which are still reverberating within me. A chilling look at the end of everything, there is still sufficient poetry in Melancholia to move even the most detached viewer. Melancholia is yet another candidate for best film of the year. It opens in Los Angeles and New York on November 11th, and in limited release on November 18th. 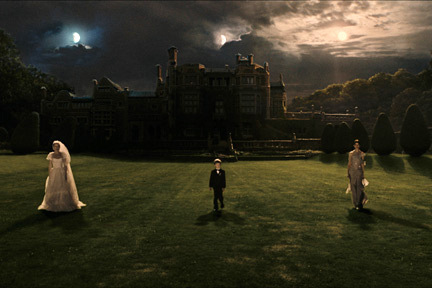 "Von Trier being who he is — half-genius, half-overgrown prankster — Melancholia is reflective of both his propensity for staging gorgeous cinematic tableaux (like the ones depicted in a couple of these stills) and his tendency for capturing realism through improvisation and inappropriate humor." Great to here you were up here at Alice Tully Hall, Tony, and gained admittance to one of the festival's centerpiece screenings. I did not push myself this year, though I will make a few of the Nikatsus in the next two weeks, if everything works out. Well, if one thing seems to be abundantly clear it's that the opening sequence is electrifying, as both you and my colleague Allan Fish (whose review was also posted today at our place) has testified to in beautifully penned accounts. I am thrilled at the use of Wagner's "Tristan" and at your posing that the film is suffused with a fair degree of "poetry." Your proposal of this as of teh the best films of the year is duly noted too!